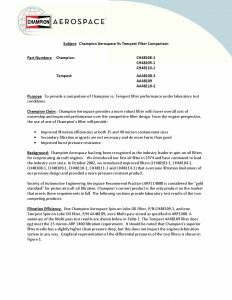 Tests show that Champion High Performance Oil Filters protect your engine up to 30% more than competitive filters. In fact, in most cases competitive filters don’t even meet the minimum SAE ARP1400B standard for filtration efficiency. 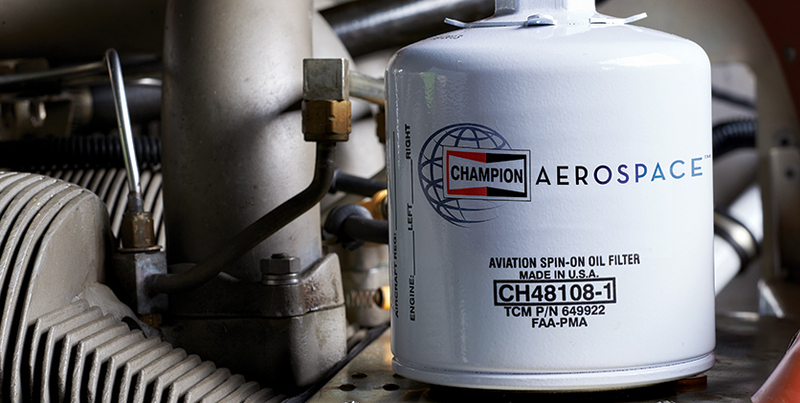 Champion brand spin-on oil filters and element filters incorporate a semi-depth filter media. The filters combine the advantages of both surface and depth-type filtration: high filtering efficiency, controlled porosity for uniform flow, water resistance, and the resistance to impulse and flow fatigue. Champion brand oil filters are known to keep dirt and harmful particles from damaging your engine. Plus, no other filters on the market have Champion’s unique, resin-impregnated, full-pleat design — 8.2 feet of layered protection for your engine. Champion Full Flow Oil Filters are designed to supply a continuous flow of filter-clean oil to vital engine parts. Champion’s Strata-Kleen filter media is a full-pleat, resin-impregnated cellulosic micronic filter media designed to trap all harmful particles including metallic chips resulting from abnormal wear. Because the oil flows through many layers of locked in fibers, there is no migration of fiber material to clog engine oil passages or affect bearing surfaces. Industry-approved tests prove that Champion oil filters trap and hold more dirt and harmful particles during its normal operating time than any other similar filter. In addition, customers have told us the height of a standard oil filter can make it difficult for them to install the filter in certain engine applications. So, operating on the premise that size really does matter, we made our Champion oil filter can 1/2” shorter and added design improvements to make our filters stronger and more effective than ever before. The filter media surrounds a corrugated steel center support tube, which provides support for each convoluted pleat of filter media and adds significant protection from filter collapse-pressure failure, especially during cold-start engine conditions. 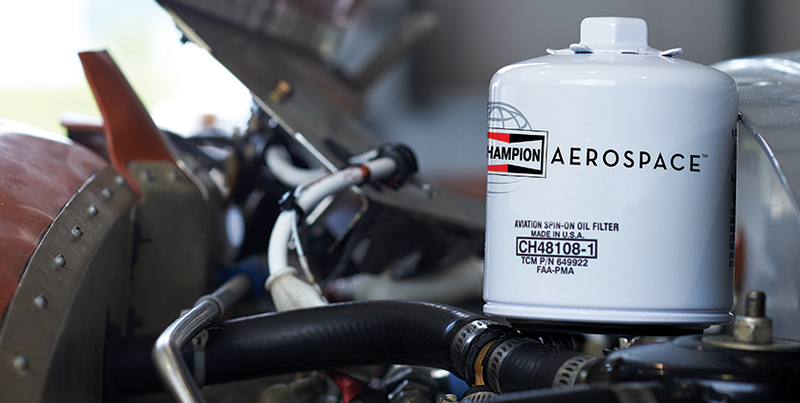 Champion offers two types of oil filter cartridge to cover all existing aircraft piston engine lube oil system applications. Replacement elements service engine-mounted or line-installed filter systems incorporating a permanent housing assembly. Modern spin-on oil filters contain the element, incorporating the anti-drain back valve mechanism (and internal bypass valve 48108-1/48109-1), and are sealed in a disposable housing. All sizes of spin-on filters are packed 12 per case of a single part number in heavy, re-shippable corrugated-board cartons. Champion spin-on oil filters have a 1″ hex wrench pad spot-welded to a tough 8-gauge steel case designed to meet or exceed engine manufacturer specifications. Safety-wire tabs are conveniently located on hex nut for easy access. High performance resin-impregnated cellulosic paper is manufactured to rigid specifications, assuring uniform density and porosity. The high quality media is preformed, convoluted and cured at a controlled temperature to form a durable, heat shock- and chemical-resistant filter medium. It provides both surface and scientific depth filtration because the oil flows through many layers of locked-in fibers. Filter material cannot migrate to clog engine oil passages or affect bearing surfaces. Heavy-duty steel mounting plate is cemented, spot-welded, and crimped to case. Even under abnormal oil temperatures and pressures, this primary part of the filter ensures freedom from troublesome oil leakage when installed per instructions printed on the case. Our tough steel case provides exceptional strength to resist the high oil pressures which occur during cold engine starts, and meets or exceeds engine manufacturer specifications. Silicone impregnated filter gasket aids in future removal. Shorter stud length on CH 48110-1 for tight clearance applications. Heavy, corrugated steel center tube supports each convoluted pleat of the filter element and produces a substantially higher collapse-pressure rating, twice that of other similar filters. Maximum full-flow design, without interference from center-bolt oil filter assemblies, provides increased oil filtration each engine-operating hour. Heavy-duty steel mounting plate is cemented, spot-welded and crimped to case. Even under abnormal oil temperatures and pressures, this primary, standard part of the filter assembly ensures freedom from troublesome oil leakage when the filter is installed according to the instructions printed on the case. Champion oil filter elements are individually boxed, each with a plastic bag containing installation gaskets and instructions. This provides ample protection for these elements in storage and assures availability of necessary items for correct installation. Within the box you’ll find a wrench pad with 1′ hex, spot-welded to case, which handles torque pressures far beyond normal removal or installation requirements. Shorter installed height – shortened can height by approximately ½”, with no impact to the filter media’s performance. Improved spring – replaces old “leaf” spring with an improved coil spring design. Thicker-walled can – increased wall thickness for improved structural integrity. Stronger center tube – redesigned center tube for added strength with collapse pressures more than double the current design. New inlet design – changed four-hole design to an eight-hole design for approximately 30% greater inlet flow area. Increased lid thickness – increased thickness of seaming lid by approximately 35%, which subsequently provided for higher burst and impulse testing. Improved baseplate thread – replaces cut thread with an improved rolled thread, without affecting tolerances on the thread dimensions. By-pass valve – meets TCM specifications.